Dear Lera—How are you these hot days? Electric light man is here and will study by new lights tonight. Everything is in a tumble. Every one is well. Baby has three teeth now. How do you like this card? Miss H. didn’t say a word it was me will tell you later. May go to Dallas tomorrow after a hat. Will write soon. Perle B. Like the artist’s sketch dashed off to capture a moment, a few words and a picture on a postcard can open a much larger world to the imagination. 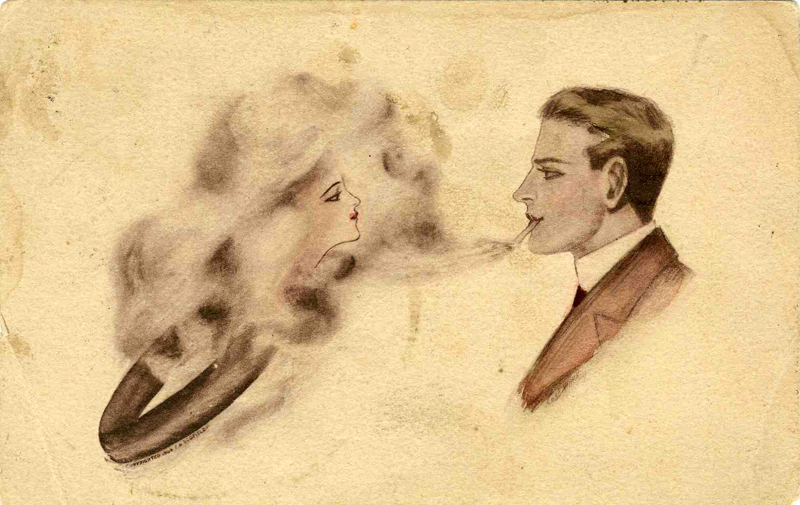 Mailed in 1911 to Miss Lera Brown at Baylor, this postcard shows a young man envisioning a beautiful woman in his cigarette smoke. Along with her face and hair there is a ring—perhaps an engagement ring—signaling that he imagines his beloved, or a yet-unmet future wife. The couple’s red lips and eyes mirror each other, and the shape and angle of the ring echo the man’s collar. It’s a dreamy picture that creates a fantasy for the viewer, that of the dashing young man who longs for love and marriage. The note on the back is also full of revealing details conveyed with great economy. The card was mailed in October but it’s still hot in Texas! And “everything is in a tumble” as the new electric lights are installed. How delightful it will be to study tonight by the light of this relatively recent home improvement. We read about the baby who is growing, and a possible trip to the big city to shop for a new hat. 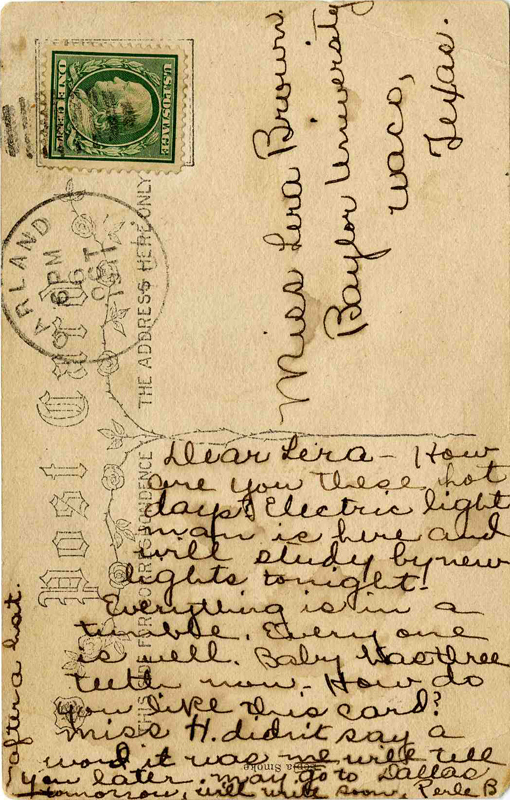 We sense that Perle B. found this postcard interesting or fitting, as she wonders, “How do you like this card?” There is a hint of mystery and a need for discretion regarding a Miss H. (“will tell you later”), and like Lera, we can’t wait to hear all the details. At some point in our lives most of us pass through that phase where we believe “if you see it in print, it must be true.” In the world of Special Collections, this can also mean that when an object has a handwritten note identifying it, you accept the note as factual. Unfortunately, real life is rarely so reliable. Take for example, a set of reprints we found of the Ulster County Gazette dated January 4, 1800 and reporting the death of George Washington. Accompanying several obvious reprints was a very nice copy on rag paper in a folder marked “Original.” Was this in fact an incredibly valuable original? Had we discovered a long lost treasure hiding in the archives? Our hearts beat a little faster until we determined that, no, it was a reprint too. Someone creating that folder (in the days before internet access) had been mistaken. Garrison Flag ““ size about 15 ft. by 18. It flew while Heroic Sumter was bombarded April 12th – 13th 1861.
during its bombardment April 12-13, 1861. It was 15 ft. by 18 ft. Sent to Hon. Geo. 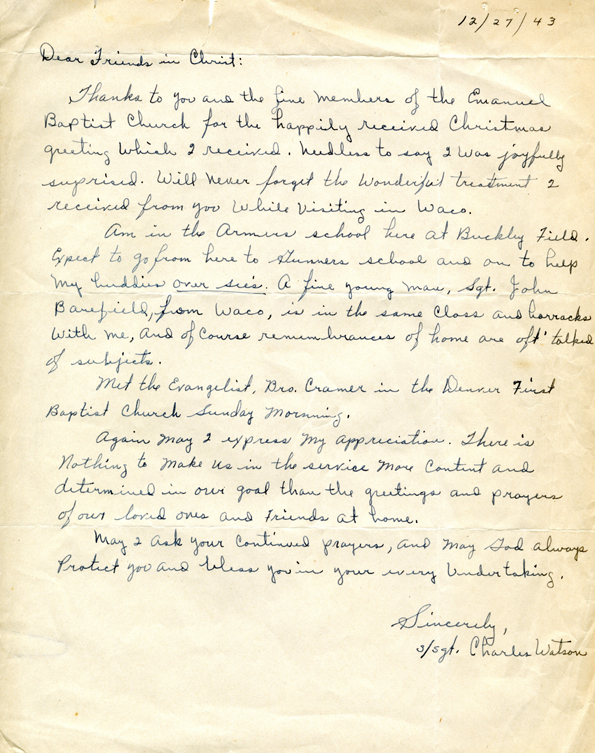 Clark in a letter. So where did the flag fly and whose flag was it? 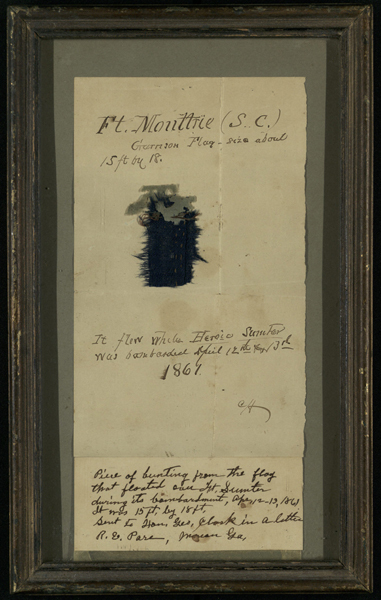 The original object indicates that this flag flew over Fort Moultrie–a position from which the Confederate Army fired on Fort Sumter. The second caption says the flag came from Fort Sumter–which would mean it was a Federal flag. And, while it seems likely that this second note is an error made by a descendant or a later owner, if this is a Confederate artifact, what do the words “Heroic Sumter” mean? If you have any thoughts you’d like to share with us on our latest puzzle, we hope you’ll leave us a comment below. By the way, there is a Texas connection to the Battle of Fort Sumter: a completely unauthorized surrender was arranged with the Union troops by Texan Louis T. Wigfall who rowed out to the fort in a skiff. Wigfall, a one-time U.S. Senator, went on to lead the Texas Brigade until his fondness for whiskey and hard cider made it necessary for him to resign his commission. He was replaced by John Bell Hood. In the days of the fountain pen, before the invention of the ballpoint, blotting paper was an everyday essential and advertising blotters were as common as today’s business cards. 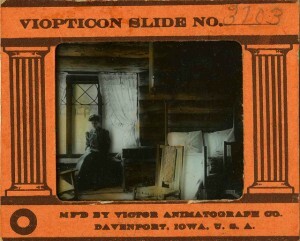 Advertising blotters were small cards, usually with colorful pictures, printed with advertising on the front. Nearly every company handed them out. The pictures might be related to the product being advertised, or they could be movie stars, pinup girls, calendars, or patriotic and historical images. To get a sense of how blotters fit into daily life, read “Tips from the Traveling Salesman” by Frank Farrington in which a frustrated man tears up a poor quality advertising blotter and gives the writer a lesson in best practices for blotter advertising [Grand Rapids Furniture Record , Vol. 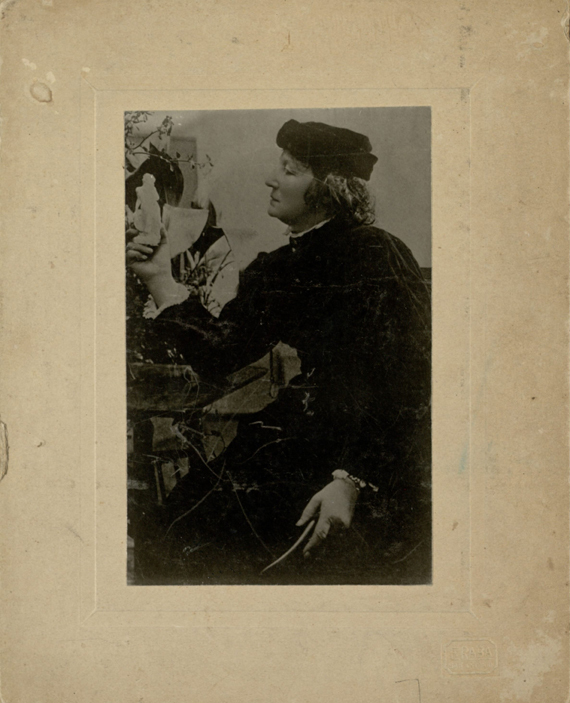 36 (February, 1921), p.121]. The Texas Collection has in its archives, as part of the Frank Watt collection, a salesman’s sample book of advertising blotters. This book contains page after page of beautiful advertising artwork from what we think is the early 1900s. Businesses could choose the blank blotters they wished to imprint with their advertising and place an order with the salesman. 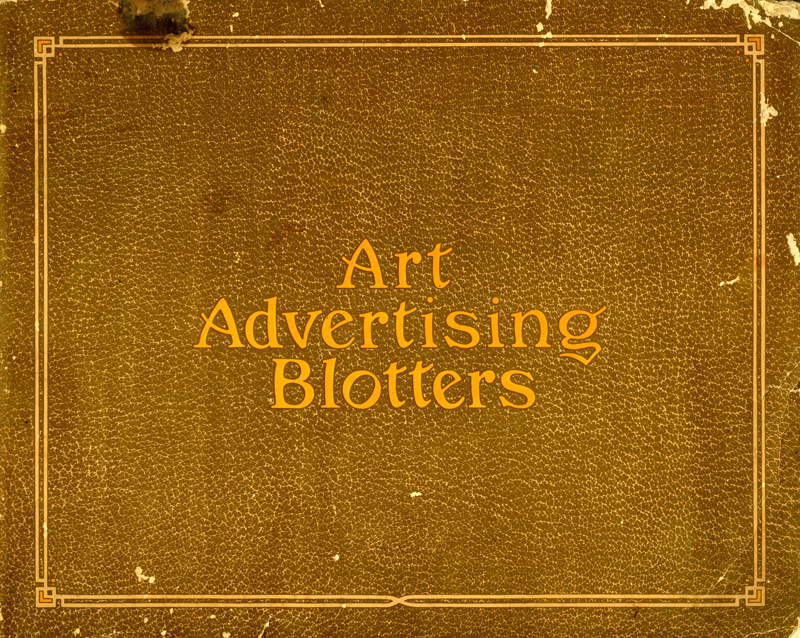 We hope you’ll share with us what you know about advertising blotters. Can you help us date this sample book? Do you recognize any of the artists responsible for the images? Add your comments below!